3 privates Sessions for $200. 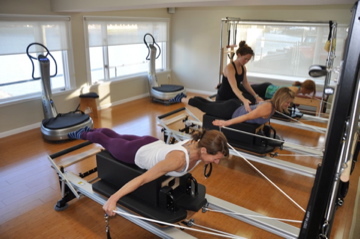 Joseph Pilates said “in 10 sessions you will feel better, in 20 sessions you will look better and in 30 sessions you will have a totally new body.” He based that quote on three sessions a week for ten weeks. Our QUICK START special is based on the same guidelines. Buy a 30 session package which will be honored over 12 weeks (in case you need a little down time or life gets in the way). Quick results & Huge savings ! Privates: Save $600 off of our regular pricing. Purchase 30 private Sessions at $2400. Semi-Privates: Save $450 off of our regular pricing. Purchase 30 semi-private Sessions at $1200.